Become Zorro, the epitome of chivalry and old fashioned heroism and you're sure to get some attention at your next event! 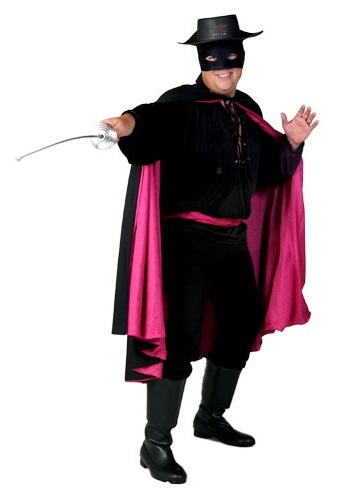 This Zorro costume comes with black pants with an elastic waist and a black polyester shirt with a corset v-neck. The cape is black material on the outside and a magenta satin lining on the inside; the sash is made of the same magenta material. Give it the Zorro authenticity with the mask that covers the head and ties in the back with two openings for the eyes. The sword and black hat will finish off the look.